In the period of the construction of the house Vicens (1883-1888), Anton Gaudí passed some seasons in the house that his customer and friend Manuel Vicens had in Alella (el Maresme), in the street of Dalt (today Anselm Clavé). For the parish of that coastal village, in more of designing a chapel of the Holy Sacrament, which was never built, he made a small intervention. 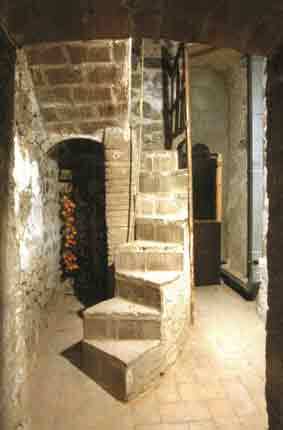 It is about the first stretch of stair of the Romanesque belfry, that Gaudí modified to win space in the ground floor. Gaudí made a crooked stair, with steps split of plant triangular, similar to what he had made on the high part of the Big Waterfall and in the stable of the estate Güell. With the steps split of triangular plant, system already described by Viollet-le-Duc in his "Dictionnaire" of Gothic architecture, of which Gaudí had a copy completely noted down and highlighted, it is achieved to put two steps in the place of one and, therefore, to reduce the space to half in plant that occupies the stair.